Lighting can change the entire mood of a room. Think about the harsh blue glow of a living room lit only by a TV, or the warm and cosy feeling of a candlelit dinner. The right shade and shape in your light scheme can soften or brighten your home with just the flick of a switch. Why not take advantage of how lighting can really change how you feel when you walk into a room or space in your home? Get creative with a cool light set-up! If you’re looking to update your home, LED lighting is the way to go. It’s the absolute latest in lighting technology, and gives you something super energy efficient that will stand the test of time. For those who want to decorate their home on a budget, LEDs are a cost-effective choice. That’s because LED lighting hardly uses any power, and LED lighting built to Australian standards can last up to three whole years before it needs replacing. Here are some of the latest in LED lighting trends found in the world of interior design. We hope they act as inspiration for your own home makeover! Add accents of soft colour to your walls with concealed LED lights at the skirting and ceiling joins. You’re only limited by your interior design creativity here. You can try a deep turquoise and contrast it with a royal purple, or create a sunset effect with gold and pale rose. This effect involves lighting the base of your kitchen island with LEDs. It’s very space age, and creates a cool optical illusion that adds a bit of drama to your decor. Highlight what’s on your shelves with some LED brightness. This effect instantly adds some art gallery chic to your home, and is a great way of showcasing allyour beloved trinkets or interior design items. This trend will keep it hot in the bedroom. 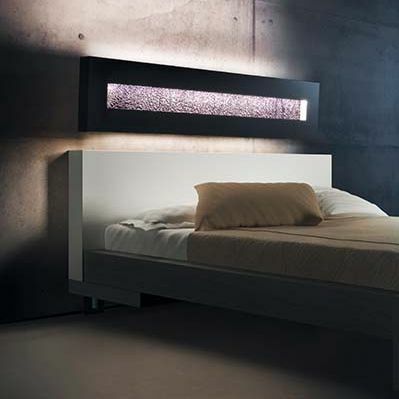 LED lighting is a great way to highlight your bed’s silhouette, and a delightfully subtle lighting option. So there you have it, a few easy ways to add instant ambiance to your home with the power of LED lighting. These are just some of the ways to use LED lighting in your home, have we missed any? Let us know, we’d love to hear from you.